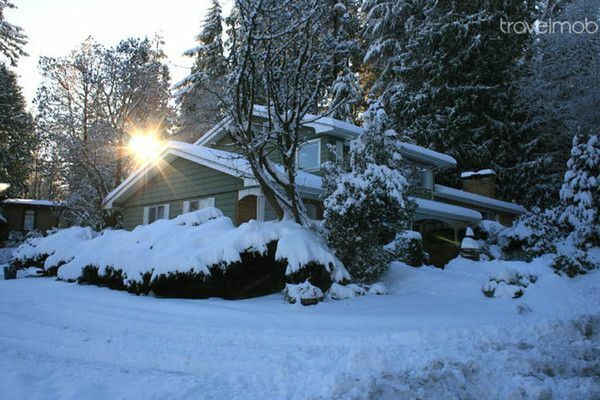 Our lovely, 5 bedroom house comfortably suits eight people, and is centrally located on a quiet street in Port Moody. Its just a 3 minute walk to an outdoor swimming pool, a 1 minute walk to the bus which will take you to the skytrain that accesses the Vancouver district. The house is on a corner lot, has a large yard next to the forest (with a lot of squirrels and different wildlife ) and a private backyard complete with patio and barbecue. Guests will have access to a majority of the house with only the garage that is off limits to the guests. The owners will not be present in the home during your stay but will be available by phone or via e-mail if required. We certainly will try to assist you with all your needs. The neighbourhood is quiet and has groomed pathways that take you though the forest for your tranquil early morning walks or alternatively provides you with easy access to public transit to get to all of the social activities that the Vancouver area has to offer. The bus stop is a 1 minute walk (runs every half hour for most of the day) and will provide access to local areas, Skytrain, and West Coast Express. Skytrain provides access to Vancouver, Burnaby, New Westminster, Surrey and also connects to another train that terminates at the Vancouver airport. The West Coast Express is a railroad train that runs along the waterfront to downtown Vancouver in the morning and then returns in the evening. It is designed to provide commuters a scenic, stress free ride to and from Vancouver. Pets are welcome but it should be noted that we have a golden retriever puppy (that will be going with the owners) so if you have allergies to pets there may be a problem for you staying at our house. The backyard is fenced but no fence is completely escape proof as we have found out several times with our puppy (escape artist).